Spiritual Companions Educators are all experienced teachers and facilitators. They deliver either the Diploma in Practical Spirituality and Wellness or tasters that lead into it. Chrissie Astell is a Spiritual Companions Educator, whose original career was as a senior nurse and at one stage worked alongside famous agony aunt, Claire Rayner, answering medical issues for the Woman’s Own problem page. In her 40s, Chrissie returned to university to study comparative religion at S.O.A.S. and then achieved two postgraduate qualifications in teaching and in spiritual development & facilitation. She has a particular interest in the angelic realm and her books include Gifts from Angels. Chrissie runs her courses in Essex, Ireland and as Home Study. Anna Bianchi is a Spiritual Companions Educator. After a long career in social work she then committed to a life of holistic and personal development. With a professional training background in social work, group work, cognitive behavioural therapy, coaching and NLP, she particularly enjoys supporting women in transition. Anna works out of Bristol and is currently preparing her Spiritual Companions offer. She welcomes enquiries. Kate Bird is a Spiritual Companions Educator. Kate’s first mainstream career was as a journalist and she spent ten years working in London for national magazines and newspapers. She then re-trained as a further education lecturer and is also a qualified meditation teacher. She runs personal and spiritual development courses both independently and at South Worcestershire College. William Bloom Ph.D is co-leading the development of Spiritual Companions which he founded and is a Spiritual Companions Educator. He is one of Britain’s leading teachers and authors in the mind-body-spirit field with over thirty years of practical experience, research and teaching in modern spirituality. His books include the seminal 'The Endorphin Effect' and 'The Power of Modern Spirituality' which describes and explains the Spiritual Companions approach. Naomi Duffield is a Spiritual Companion Educator. She has been committed to a spiritual path since trauma in her early teens. She was attracted to Spiritual Companions because it is both spiritually literate and psychologically literate. She has found that many paths seem to choose one or the other, but Spiritual Companions integrates both. For the past 10 years she co-managed the Mangreen Centre in Norfolk where she was responsible for the Spiritual Education Programme, including teaching Spiritual Companions and Psychospiritual Counselling. In Spring 2017 she moved to Swanage in Dorset where she runs the Swanage Retreat Centre. Martine Moorby is a Spiritual Companion Educator with a background in Secondary Education as Head of Department. She then moved into a career of coaching and holistic wellbeing. As well as teaching Spiritual Companions courses, she teaches Reiki and Emotional Freedom Techniques. She also combines her skills and understanding in one-to-one sessions where she helps her clients and students reflect, develop their awareness and maximise their healing potential. Martine’s site can be found at www.martinemoorby.com. Carl Stonier Ph.D. is a Spiritual Companions Educator and Trustee. He had a 28 year career in nursing before switching to counselling, where his PhD explores the relationship between emotional health and physical health. He is an approved supervisor and training therapist for Nottingham Trent University, Sheffield Hallam University and Doncaster College, and supervised the work of the team of 25 counsellors in a counselling agency for 9 years. He has worked with people with life threatening illnesses (especially cancer) for many years and is the Honourary Chief Executive of National Cancer Support. His offer can be found at www.personal-potential.co.uk. Sarah Jane Williamson is co-leading the development of Spiritual Companions and is a Spiritual Companions Educator. Sarah Jane has in-depth experience of working in both mainstream organisations and spirituality-based cultures. 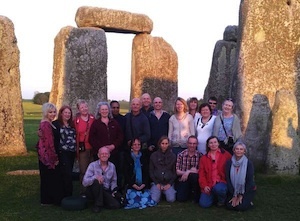 She has 25 years spiritual practice based on deep consciousness and heart connection, exploring Druidism, western mystic traditions, Celtic Christianity and contemplative prayer. Hoppi Ulla Wimbush is the founder of the Lammas Earth Centre. She is passionate about raising consciousness through Spirituality, education, healing and Nature connection. She delivers training & consultancy for numerous organisations and runs powerful transformational healing & coaching programs (www.hoppiwimbush.com). She has designed, written and delivers various accredited qualifications in Self development, Emotional Intelligence and Spirituality. She has created her own artisan land-based skin care brand “Flower Power Organics” which puts nature at the heart of business (www.flowerpowerorganics.co.uk). She is devoted to her family, shares three beautiful children with Tao, her husband, and is committed to helping all life flourish in Love & Beauty.